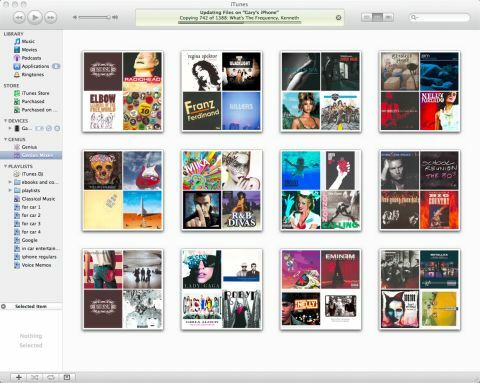 iTunes 9 feels snappier, the Column Browser is a much-needed improvement and the Home Sharing feature works very well. We're not convinced by iTunes LP or Extras - although we're sure the former would look just great on a Tablet - and it's still a bit slow, but the improved device management makes this a worthwhile upgrade. We have mixed feelings about iTunes: it can be slow - especially if you're using external drives, which it forgets about far too often for our liking - and it's desperately due a redesign. Hurrah, then, for iTunes 9: it's got a new look, it's got some new features, and in the form of iTunes LP - 21st Century sleeve notes - and iTunes Extras - DVD extras without the DVD - it's got new things to flog you. So is it any good? iTunes 9 certainly looks better. The glassy status area looks more glassy, the grey metal looks shinier and the playback buttons look more buttony. There's also a new Column Browser, which makes scrolling through large libraries much, much faster, and a new Genius Mixes feature that attempts to create music mixes you'll like. It looks good and works well, although turning it on isn't obvious: you need to go into the Store menu and then click on Update Genius. It's also got a strange interface: while it creates a playlist based on grouping particular kinds of music together, so for example it'll lump Elbow, Doves and Supergrass into one mix and stick Lady Gaga, Pet Shop Boys, Girls Aloud and Robyn into another, it doesn't let you see what's in the playlist. If you want the playlists on your iPod or iPhone you'll need to switch them on, too: you'll find them in the Music tab under Playlists. There's another not-very-well-advertised new feature: HE encoding. If you go to iTunes > Preferences > Import Settings and select AAC as your import format of choice, you'll see a checkbox for "Use High Efficiency Encoding (HE)". HE-AAC is for very low bitrate audio, which means it won't be useful to the average iTunes user. The Windows version has had a bit of interface polish too, but we still think it looks a bit strange. If you're running Windows 7 you can skip and stop tracks from the taskbar thumbnail preview, and there's a basic Jump List that enables you to launch the iTunes Store or iTunes itself.